Guadalajara International Book Fair, in conjunction with the UDG University Press invite other university presses to attend the Eighth Annual University and Academic Press International Forum. This professional development program gives you the opportunity to share ideas, perspectives, and experiences that strengthen your publishing endeavors and boost dynamism in this important sector. This year, the central theme is “Shifting Paradigms”. We seek to stimulate reflection in underexplored areas such as publishing branding and marketing, which are the main pillars of commercial processes in other sectors of the industry. University and academic presses command valuable funds whose aim is to disseminate knowledge, however their potential is not fully exploited and often these collections are difficult for readers to find. This is why we need this timely discussion to find more effective ways to promote our catalogs. Our sessions will also include a discussion on how academic debate should prompt public debate; a moment to analyze the evolving processes in university presses; and we will insist on ongoing professional development in the area of rights to strengthen the figure of the university press as a content producer. Editor and translator. He studied physics at the UNAM and translation at the Colegio de México. He is the general director of Publications and Editorial Promotion at the UNAM. He has worked as the managing editor and director of production for the publishing house Difusora Internacional (which changed names to Tiempo y Lenguaje), managing editor of the Joaquín Mortiz publishing house, managing editor of the company Texto Universitario y Referencia Profesional (part of Grupo Patria Cultural), managing editor of Editorial Clío, Libros y Videos, managing editor of Universidad Veracruzana, managing editor of the Fondo de Cultura Económica, and general director for the Secretariat of Public Education’s National Commission for Free Textbooks. He has also collaborated with Grupo Patria Cultural. He was managing editor of the UNAM’s Office of Publications and Editorial Promotion and led the Production Management and Editing Management departments at the Fondo de Cultura Económica. He was a member of the Board of Directors for the National Chamber of the Mexican Publishing Industry and the Managing Board for Librerías de Cristal. He was on the judging panel for the Arnaldo Orfila Reynal Award for university publishing granted by the University of Guadalajara and was a member for the Metro Cultural Foundation. He has taught for the Juan Grijalbo scholarship program and in the CANIEM’s certificate program on Book Publishing Processes. In 2011 Chile granted him the Bernardo O’Higgins Medal in the order of Commander. She is director of the University of Guadalajara’s publishing house. She is president of the Association of University Presses in Latin America and the Caribbean (EULAC). She serves on the board of directors for the Altexto Network of University and Academic Presses in Mexico. She forms part of the organizing committee for the International University Press Forum. She earned a bachelor’s degree in Spanish Language and Literature from the Universidad Nacional Autónoma de México and a master’s in publishing at the University of Guadalajara’s International Center for Professional Studies for Editors and Booksellers. Conference: "Language, herbs and ancestral stimulants from América to the world"
He was born in Argentina and lives in Madrid, Spain. He is a branding consultant and a consultant for strategic management in communications. He is the director of OXB Branding, based in Madrid and Buenos Aires. He is Director of Strategy and Editorial Coordinator of Editorial Experimenta (Madrid). He has a master’s degree in Communication and Corporate Management (Universidad Mayor Chile), in Design Thinking Consultancy (University of Salamanca), a Diploma in Sustainable Communication and CSR Management (Universidad Mayor Chile) and in graphic design (University of Buenos Aires). He created the Oxytobrands concept and wrote the book titled Oxytobrands: Human Brands for an Emotional Market, published in Argentina, Peru, Colombia, Mexico and Spain. He is currently working on his book Biobranding: hacia la construcción de un ecosistema sostenible de marcas. He currently works and consults on projects in branding, management and design for companies and organizations (both public and private) in different countries. He speaks at conferences and has given talks on Oxytobrands, Biobranding, Emotional Branding and design in more than 40 different cities in Argentina, Chile, Colombia, Peru, Mexico, Spain, Bolivia, Costa Rica, Panama, Ecuador and Colombia. He worked in education at the University of Buenos Aires; he was the academic director of the Escuela Superior de Diseño de Buenos Aires, and from 1995 to 2010 at the University of Palermo, where he created and coordinated the Corporate Image Design and Branding department. He has been on the judging panel of national and international contests for more than 25 years, and he continues to publish his work in different graphic and digital publications in Argentina, Chile, Peru, Colombia, Ecuador, Spain and China, among others. Alejandro specializes in Latin American book history, sociology, and editing. He has worked on several national and international research projects on topics such as production and international distribution of symbolic goods, university publishing, translation and translation policies, and book fairs. He coordinates the Book and Publishing Studies Program at the Institute for the Study of Economic and Social Development. He also regularly collaborates on designing, implementing, and evaluating book-related public policies and legislation in Argentina. He regularly writes for several Argentine media about the publishing market and public polies on books. He is a Doctor of Social Sciences and a researcher for the Argentine Scientific and Technical Research Council (CONICET). He manages the master of sociology program at the Institute of Higher Social Studies that belongs to the National University of General San Martin. In addition to writing articles on his research topics, in 2014, he published Una historia del libro judio. La Cultura Judía Argentina a Través de Sus Editores, Libreros, Traductores, Imprentas y Bibliotecas (Siglo XXI.). He is currently chair of the Faculty of Letters at the University of Coímbra. he has served as director of the University of Coímbra’s publishing house since 2011. he was president of Portugal’s Association of Higher Education Presses from 2011 to 2014. he is in charge of the UC Digitalis Platform, which is a global program founded by the University of Coímbra for the publication and promotion of texts in Portuguese. he is Portugal’s representative in the central group for the international consortium Open Access in the European Research Area through Scholarly Communication (OPERAS). She has a bachelor’s degree in law from the Instituto Tecnológico Autónomo de México (ITAM). She earned her master’s and doctorate in law at Stanford Law School in California. She is a research professor at the Center for Economic Research and Education (CIDE). She collaborates with the CIDE’s Drug Policy Program (PPD) and writes for the El Universal newspaper. She has taught at the UNAM’s faculty of law, worked as a researcher at the Institute for Legal Research at the UNAM, and been a visiting researcher at Georgetown University’s School of Law in Washington D.C. She recently did a stay as a visiting professor at the Schell Center for International Human Rights at Yale University’s Law School in the United States. She has written several books on drug policy. The most recent include: Sobredosis Carcelaria y política de drogas en América Latina (co-author, Sergio Chaparro); Consumo, consumidores y las respuestas estatales en América Latina and De la detención a la prisión: La justicia penal a examen. She is a journalist based out of Brooklyn, New York. As international editor for the news website The Conversation, she works with professors and researchers around the world, specifically in Latin America and the Caribbean, to “translate” academic knowledge into journalistic language for the general public. She is also a freelance writer for publications including Slate, the Atlantic, Huffington Post, Wired, and other English-language news outlets. She has a bachelor’s degree in literature from the University of Wesleyan and a master’s degree from the Fletcher School of Law and Diplomacy (Tufts University). Born in Virginia, she has worked in Mexico, Argentina, Uruguay and Spain. She has over 20 years of experience in the national and international publishing sector in the areas of negotiation and rights sales (to the rest of the world), as well as coordinating sales and post-sale management. She participates in the Frankfurt Book Fair, where she has sold rights for 23 years and has attended the Guadalajara, LIBER, Bologna, Seoul, Pekin, Buenos Aires and New York book fairs. She has participated in several fellowship programs. In 1999, she worked for four weeks at the Herder Verlag publishing house in Freiburg, Germany and in 2012, for ten weeks at Fischer Verlag in Frankfurt, Germany. At both publishing houses, she supported the rights department. She currently works as a publisher at the Brazilian branch of the German publishing house Hogrefe Verlag and is responsible for the sale of rights at the university publishing house Unesp in Brazil. General editor of the University of the Andes since 2013 (Bogotá, Colombia). He was editorial director at the Caro and Cuervo Institute from 2011 to 2013, editorial coordinator for the Bogotá Mayor’s reading advocacy program Libro al Viento from 2006 to 2012, and editorial director for reference books at the Norma publishing house from 1995 to 1999. He has published the short story collections Salón Júpiter y otros cuentos (1994), Guía para extraviados (1997), Asuntos familiares (2000), Artículos propios (2011), Escena en un bosque (2011), Antología nocturna (2013) and Relatos impares (2018); three novels: La celda sumergida (2003), Cinco tardes con Simenon (2003), reissued under the title Encuentro en Lieja (2014) and Veintinueve cartas (2016); as well as the biography Eugène Delacroix, el artista de la libertad (2005). He has translated over twenty books from authors including Alice Munro, Leigh A. Payne, Oliver Sacks, Thomas Cahill and Chloe Aridjis, among others. He has a bachelor’s in philosophy and letters from the University of the Andes and is a candidate to receive his master’s degree in medieval literature at the Complutense University of Madrid. He has taught at the University of the Andes and the Pontificia Universidad Javeriana. He worked as a tutor in the master’s in creative writing at the National University of Colombia and the literary creation program at the Universidad Central. Editor and translator, María Teresa studied primary and high school in Moscow during the eighties. She obtained a Bachelor of Russian Language and Literature from the Faculty of Foreign Languages at University of Havana, Cuba. Since 2006, she has worked as a freelance translator, proofreader, and editor. She focuses on translation from Russian, French and Italian into Spanish for Argentine and Spanish publishing houses. She has managed the Universidad Pedagógica Nacional University Press (Argentina) since 2014, where she began to work in 2010 as publishing assistant and coordinator. She undertook her professional education by attending university press forums and seminars organized by fairs like these, as well as academic institutions, and the publishing industry. They are important venues for exchanging experiences and meeting editing colleagues from universities around the world. Sociologist, photographer and editor. Atienza has spent more than nineteen years exploring different areas of the publishing world: as director of the books supplement Hoja por hoja, as editor for the Para Entender collection, as Head of the Editorial Department at La Gaceta for the Fondo de Cultura Económica, as a columnist for several media companies since 2010, and as publishing cofounder and co-director of the independent imprint called La Caja de Cerillos. He is also currently the publishing director at El Colegio Nacional. 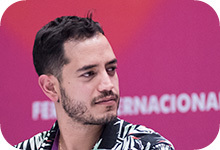 Having earned a bachelor’s degree in international business, he works as the general coordinator for professionals at the Guadalajara International Book Fair. Some of his main duties include developing the content for programs including the International Editor’s Forum, the International University and Academic Publishing Forum, the International Editorial Design Forum, and the International Illustration Forum (FILlustrates), among others. He served on the judging panel for the 2018 Iberoamérica Ilustrates Catalog. He has participated as a speaker in a variety of forums and activities related to professional development in the publishing industry at book fairs in Bologna (Italy), Buenos Aires (Argentina), LéaLA (United States), FILIJ (Mexico), Taipei (Taiwan), Bogotá (Colombia), Medellín (Colombia), Oaxaca (Mexico), as well as specialized meetings, including Festilus (Chile), TLA Annual Conference (United States), FILI (Finland) and the Guadalajara International Film Festival (Mexico). Founded Marketability in 1999 after 18 years working in international sales and marketing roles within academic, STM and professional publishing (including Taylor and Francis, Elsevier, Ashgate, and Gower Publishing). She runs most of Marketability’s marketing courses as well as in-company training for all of the UK’s largest publishers. She also tutors for the other UK training providers – Publishing Training Centre, Publishing Scotland, Publishing Ireland, and ALPSP (Association of Learned, Professional and Society Publishers). Internationally, she works with the Singapore Book Publishers’ Association, National Book Development Council (Singapore), and the Australian Publishers’ Association. She runs training programmes for Chinese publishers, both in Beijing and in the UK, and has trained for CANIEM, the Asian Council of Science Editors, and the Russian Guild of Book Dealers. She’s conducted in-company training for international academic and STM publishers in Singapore, China, Hong Kong and the US as well as in the UK and Europe.